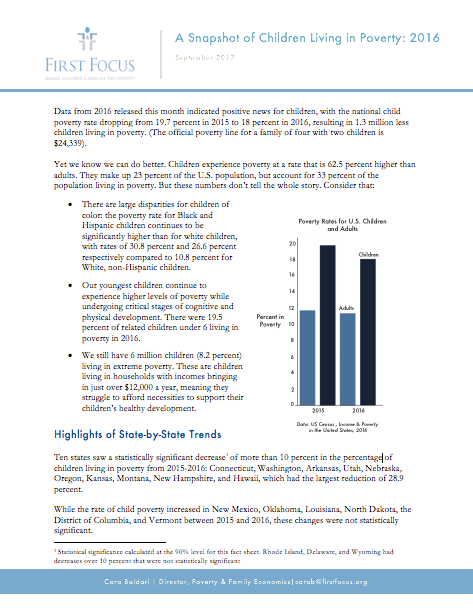 Data from 2016 released this month indicated positive news for children, with the national child poverty rate dropping from 19.7 percent in 2015 to 18 percent in 2016, resulting in 1.3 million less children living in poverty. (The official poverty line for a family of four with two children is $24,339). Yet we know we can do better. Children experience poverty at a rate that is 62.5 percent higher than adults. They make up 23 percent of the U.S. population, but account for 33 percent of the population living in poverty. But these numbers don’t tell the whole story.